Part 2 for The Coffeevine November 18 box, in this post I’ll only write about the coffee from Blommers Coffee. In Fridays post, you’ve been able to read about the coffee and also what I expect from the coffee. In this part, I’ll share my recipe for an awesome pour-over and Espro travel press as usual. 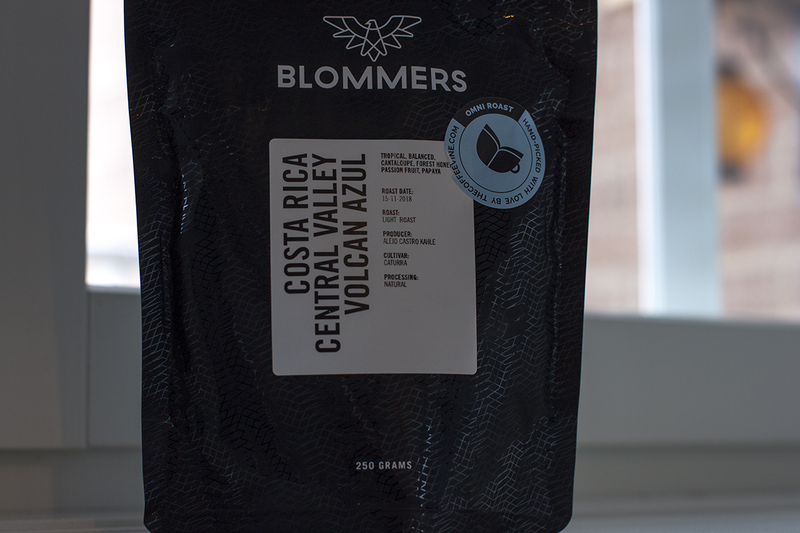 As I was cupping Blommers Coffee – Volcan Azul I found a lot of honey in the coffee. It also had an acidic passionfruit taste throughout the whole cup. Blommers Coffee wrote about “Tropical, balanced, cantaloupe, forest honey, passion fruit & papaya”, but I have to be honest that it’s a bit different to have so many notes. But I guess that a different person might feel other notes than I did. Sweet honey and passion fruit. 1) Pour 60g water for blooming for 45 seconds. 2) 45 seconds in, begin your second pour of 60g of water. 3) 1 minute and 30 seconds in, begin your third pour of 60g of water. 4) 2 minutes and 15 seconds in, begin your fourth pour of 60g of water. 5) 3 minutes in, begin your fifth pour of 60g of water. 6) Stop the dripper at 3 minutes and 30 seconds. *Always rinse the paper filter with filtered hot water, don’t forget to wash the coffee server with clean water afterward, because the taste of the paper might linger. The coffee is actually very good, I could easily drink this often even though it’s not as balanced as I expected. So for me to feel that this can be drunk every day means it’s a good coffee. I’m also very happy to finally drink a Natural processed coffee from a Coffeevine box, and it’s also interesting that it’s from Costa Rica. If you have an Espro and a Pour-Over … What should you choose to brew with? As I wrote above, you get a more balanced cup with the Espro, you also get a great result every time as it’s impossible to make mistakes. Do you want your cup to show a bit of aromatics, brew with a Hario V60 etc. It becomes more spicy, aromatic and nicer on its own. I prefer brewing it with a pour-over, because the coffees most primary aspect is the notes of passionfruit. Next post The Coffeevine November 18 Box – Morgon Coffee Roasters Again!